Radiation absorbed by aluminum hydroxide and oxyhydroxide nanoparticles surrounded by a water layer causes the release of hydrogen along with aluminum reduction. Radiation-induced changes are critical for nuclear waste processing. Image courtesy of Patricia Huestis, University of Notre Dame (drawing), and Xin Zhang, Pacific Northwest National Laboratory (gibbsite, microscopy) Enlarge Image. Cold War plutonium production activities created complex wastes. Vitrifying the waste for final storage is complicated by aluminum from nuclear fuel reprocessing. Knowing how aluminum particles behave in highly radioactive liquids is vital. Here, research focused on humid particles suggest that the particles' bulk properties do not change substantially upon radiolysis. Gamma radiolysis led to the formation of hydrogen from the adsorbed water with the oxygen atoms remaining on the surface or intercalating into the bulk. Why It Matters: At the Hanford Site in Washington State, high-level radioactive wastes contain vast amounts of aluminum-based particles. For decades, these particles have been exposed to large doses of ionizing radiation. Engineers need to understand the radiation-induced modifications to aid particle dissolution and removal from the waste. For those attempting to remove the waste, the study's results confirm the need to consider both the unexpected chemistry and physics at the solid-water interface as well as the bulk solubility of the aluminum phases. Summary: At the Hanford Site, the highly alkaline waste contains aluminum hydroxides and oxyhydroxides, such as gibbsite (Al(OH)3) and boehmite (AlO(OH)). These solids must be removed before vitrification. The aluminum compounds decrease the stability of the vitrified waste through the precipitation of nepheline. The aluminum is often in fine particulates that are entrained in process streams as slurries. These tiny particles can interfere with the flow of waste. At the Interfacial Dynamics in Radioactive Environments and Materials (IDREAM) Energy Frontier Research Center, researchers are investigating the radiolytic stability of aluminum hydroxides and oxyhydroxides, where the radiolysis effects at the solid-water interface can be distinguished from radiation damage to the bulk material. 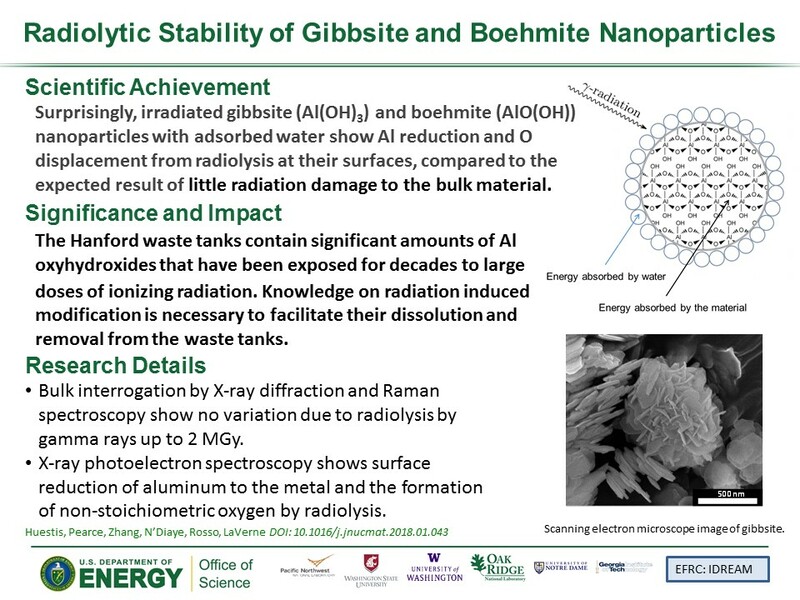 In this study, gibbsite and boehmite were irradiated to 2 MGy using gamma rays and to 175 MGy with alpha particles (separately) and then analyzed with a cadre of bulk and surface sensitive characterization techniques. In each case, comparison of X-ray defraction and Raman spectroscopy (which are sensitive to the bulk structure) for pristine and irradiated samples showed little change due to radiolysis. To further study these samples, the team used X-ray photoelectron spectroscopy (XPS) and total electron yield (TEY) X-ray absorption near edge structure spectroscopy (XANES). In these cases, evidence for surface-specific changes were revealed for samples irradiated with alpha particles and with gamma rays. Further characterization with XPS of gibbsite and boehmite indicated reduction of the surface aluminum(III) to aluminum metal as well as the formation of non-stoichiometric oxygen when irradiated with alpha particles. 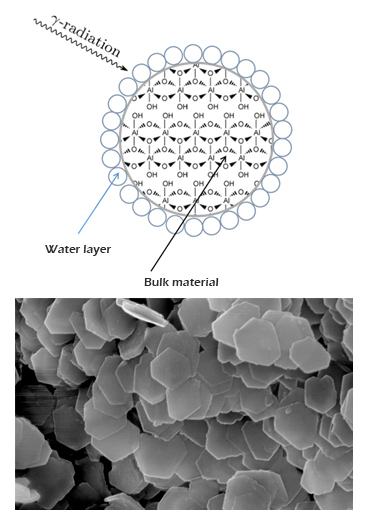 Aluminum K-edge XPS and TEY XANES revealed the formation of oxygen-centered defects. These results are probably due to loss of hydrogen from the hydroxyl (OH) groups and rearrangement of the remaining atoms. The surface appears to be sensitive to radiolysis with little effect on the bulk material.